You may stop using the Site at any time. Fazzone & Harrison Realty LLC may suspend or terminate the Site at any time at Fazzone & Harrison Realty LLC’s discretion and without notice. Fazzone & Harrison Realty LLC may also terminate, limit or suspend your access to the Site for any reason at any time and without notice. For example, Fazzone & Harrison Realty LLC may terminate your access to this Site if you are not complying with these Terms or if Fazzone & Harrison Realty LLC determines that you are a repeat infringer of third-party intellectual property rights. Fazzone & Harrison Realty LLC respects the intellectual property rights of others and expects you to do the same. Per the DMCA, Fazzone & Harrison Realty LLC will respond expeditiously to claims of copyright infringement on the Site if submitted to Fazzone & Harrison Realty LLC’s Copyright Agent as described below. Upon receipt of a notice alleging copyright infringement, Fazzone & Harrison Realty LLC will take whatever action it deems appropriate within its sole discretion, including removal of the allegedly infringing materials. Fazzone & Harrison Realty LLC may request additional information before removing any allegedly infringing material. In the event Fazzone & Harrison Realty LLC removes the allegedly infringing materials, Fazzone & Harrison Realty LLC will immediately notify the person responsible for posting such materials that Fazzone & Harrison Realty LLC removed or disabled access to the materials. Fazzone & Harrison Realty LLC may also provide the responsible person with your email address so that the person may respond to your allegations. 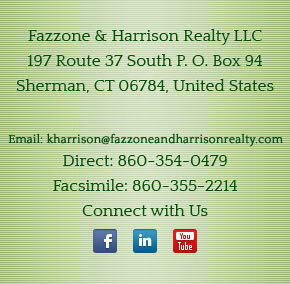 Fazzone & Harrison Realty LLC reserves the right to terminate, limit or suspend any user’s access to the Site in the event of repeated infringing activity. If you believe that a user of this Site is a repeat infringer, please follow the above instructions to contact Fazzone & Harrison Realty LLC’s Copyright Agent. Please include sufficient information to assist Fazzone & Harrison Realty LLC in determining that the user repeatedly engaged in infringing activity.